Anyone who’s used Waze is familiar with the navigation app’s insistence on making left turns on busy streets where there’s no signal to stop traffic. 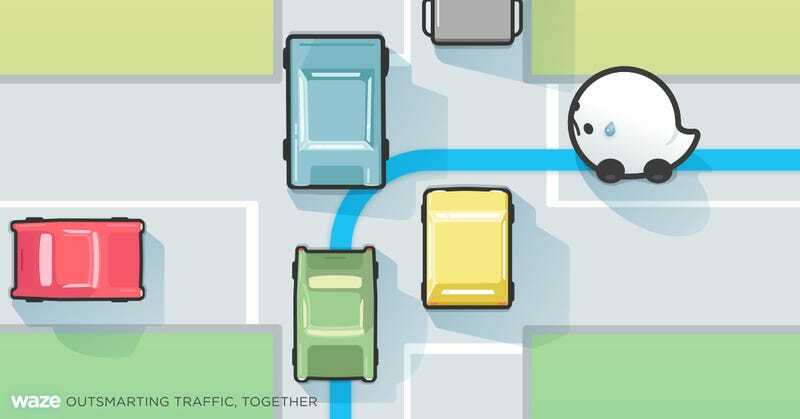 Waze actually has a name for these types of situations: “difficult intersections.” And a new feature will become the default setting on the app to help drivers avoid them—something Waze says will make streets safer. For the past few years, Waze’s community network has been working to identify these intersections like the “risky left” described above. Now drivers will be given an alternative route, like going to the closest signal instead, or using a series of right turns to make turning left easier. This might add travel time in some cases, and not every single difficult intersection can be avoided. Drivers can also disable the new feature if they would rather make their way across a multi-lane road, Frogger-style. A less stressful commute for drivers also means safer streets for the other users. Left turns are particularly dangerous for pedestrians, which is why LA’s big crosswalk redesign stops traffic in all directions to let cars turn left. “For people walking in Los Angeles, left-turning drivers pose a serious threat,” said Emilia Crotty, policy and program manager for Los Angeles Walks. The largest portion of traffic collisions that kill or seriously injure people walking or biking on LA’s streets are from left turns—about 12 percent. That’s more than speeding (10.8 percent) and red light running (5.2 percent).